We’ve been talking about why Latin America is the best place for you to expand your business to. Now, you are probably thinking that having an e-commerce with global dimensions might be an indicator on how your business is just on the right path to success, after all, the more the merrier, right? Not always. Expanding your business globally using a one-size-fits-all solution might not be the most suitable idea to a deal as important as your e-commerce. Treating all countries where you have potential consumers as if they all worked the same way could become a loss of time, energy and resources for your business, not to mention the frustration of realizing your investments didn’t convert into actual buyers. Since each and every consumer market out there has to (or should be) dealt according to its peculiarities, online shops should take into consideration some aspects in order to deliver the best experience possible, such website language, regional vocabulary changes, currency displayed and, especially, local payment methods. This is exactly why EBANX designed a way for international companies aiming to take their revenue to the next level and offer their services in Latin America. Without the need of opening a local entity in each country, these businesses can just integrate with a local partner (EBANX) and offer over 30 local payment methods in local currency in six Latam countries (and counting): Brazil, Mexico, Argentina, Colombia, Chile and Peru, that together represent 80% of the Latin American population. EBANX collects your customer’s payments in the region in local currency and remits the amount sold to your bank account abroad. Balancing regulations from at least 3 different countries every time a single transaction is made, while offering over 30 local payment methods in all those countries for companies spread all over the world, as well as connecting merchants and end-users while double checking these will be nice safe transactions to all parties involved to then remit that money abroad to our merchant’s bank account. Not to mention taking care of the customers whenever they have questions regarding their payment can be quite a tricky process to put together, which is why we must assure EBANX partners up with companies that follow a basic set of configurations. Pretty obvious requirement, isn’t it? In order to sell your goods or services to millions of eager customers in Latam you need to have a company registered. This will ensure we are delivering serious purchase experiences to your worthy potential consumer base in Latam countries. Our business model in its essence is cross-border. This means your company can be incorporated in any country in the world as long as you’re selling abroad, to Brazil, Argentina, Mexico, Chile, Peru & Colombia. In other words, if you are selling from your country to your country, EBANX can’t process these payments for you. But, if you are to sell across borders to Latin America, you can have us as your payment partner. In order to legitimate our cross-border soul, as mentioned just before, your company should be abroad, as well as its bank account, and if your business involves goods being shipped, they must also come from a different country than the one you’re selling to. Have in mind that warehouses are also included in this matter. 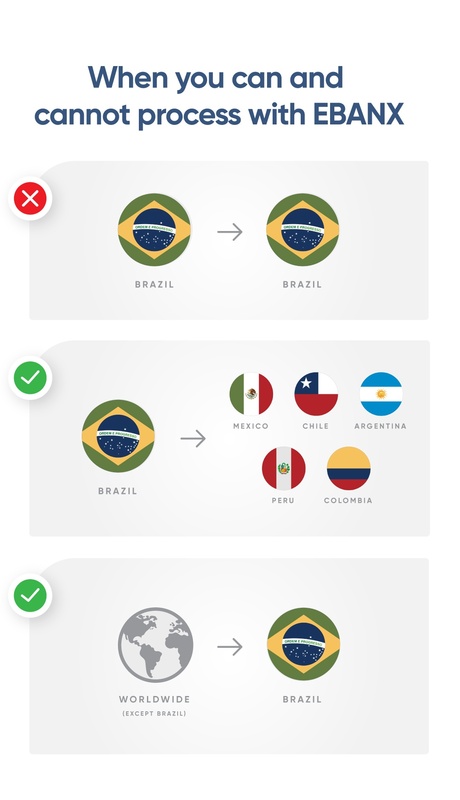 To sum up in simpler words: sell like a local to LATAM even though you’re completely abroad. These businesses are out of our business scope, therefore not ideal for partnering with us. By fitting into these characteristics, your business will certainly feel at home when it comes to selling products or services to Brazil, México, Argentina, Colombia, Chile & Peru with EBANX. Not to mention you will notice an extravagant revenue boost on your bank statement at the end of every month. Not worry about opening a local entity and stress with logistics, tax lawyers, an office in every country, or local staff. Have your product/service sold in local currency in each and every one of the countries mentioned above. Offer over 30 relevant payment methods, including locally valid credit cards and cash payments. Experience up-to 3x higher credit card approval rates. Add fraud prevention tool to your transactions with no additional cost. Better safe than sorry! Receive your money in the country of your business’s bank account. In USD or other currencies. Have support on the integration of your website to our API, including plugins to the major e-commerce platforms out there, making the whole process a much simpler one. Time is money! Comprehend all the major KPI’s of your sales on your dashboard, all info is broken down according to country, currency, time, amount sold and other options to filter your important data. Customer Service: no need for spending money with customer service, we do it for you. Ready to Sell Like a Local? Offer local payment methods with EBANX and reach the full potential of the Latin American ecommerce market.